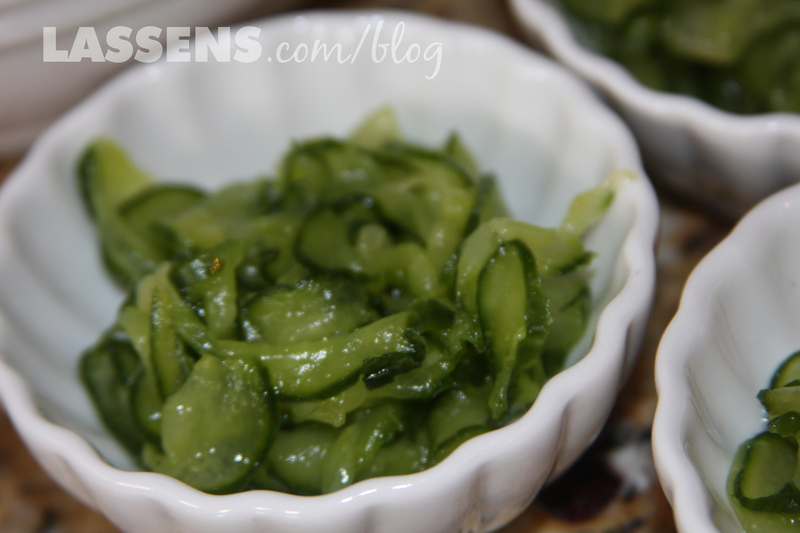 Salad, Side Dish, Appetizer, Sandwich Topping — You Will Love this Simple and Easy Recipe! If you have enjoyed a Danish Smörgåsbord (or Swedish, for that matter) you have probably noticed a multitude of small serving dishes with little pickles of all kinds, red cabbage (rødkål, see Oda’s recipe here), peas and carrots, cucumbers, pickled beets, and other items. These can be enjoyed as toppings for open-faced sandwiches (smørrebrød), or as a small side dish. The Danes use them as Americans use cranberry sauce at Thanksgiving. These tasty sides are not reserved for holidays, but are everyday kind of dishes. They add such a pop of color and taste to many meals, and I love them! 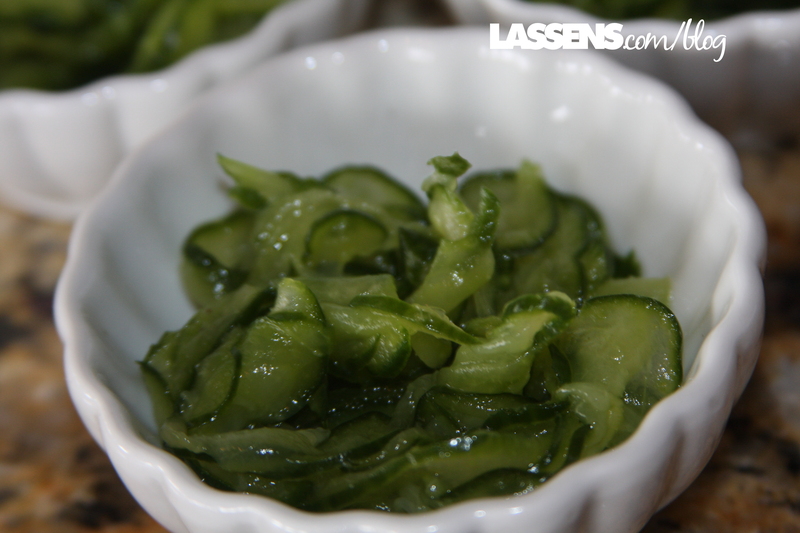 The Lassen family loves to have dinners together, and when we make the assignment list, Cucumber Salad is nearly always included. This is one of my favorite Danish recipes, and also one of the simplest. It adds a great flair and pop of flavor to basic meals and fancy ones alike. Oda, our founder, taught me how to make this salad, and when she and Hilmar downsized their living space, I inherited her Bosch Mixer with the slicing and grating attachments. 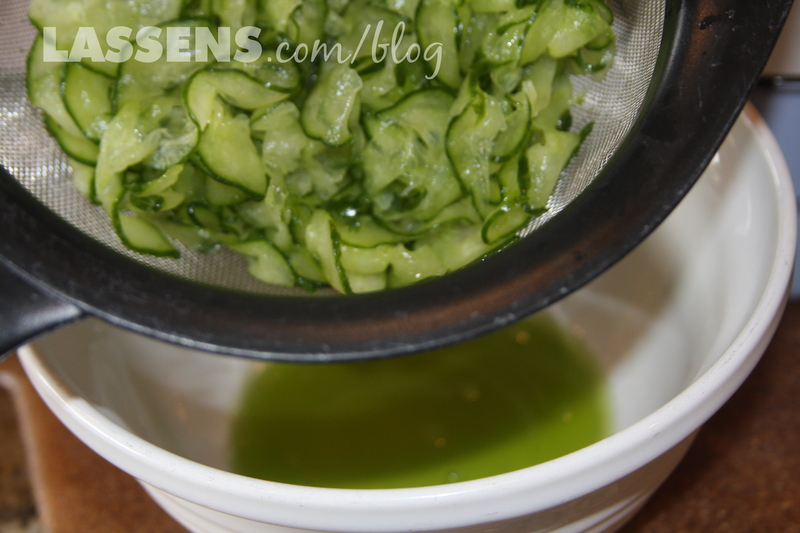 I used it to slice the cucumbers for this post! Wash and dry the cucumbers. 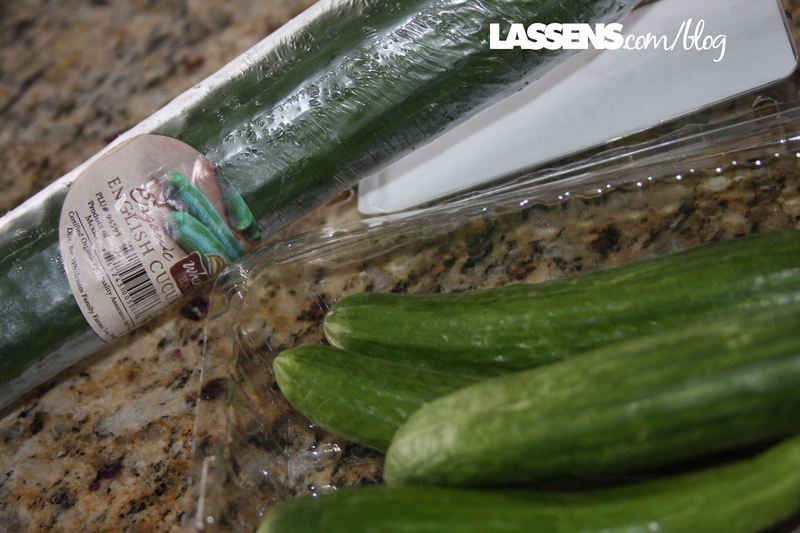 English and Persian cucumbers do not need to be peeled. *Regular cucumbers have thicker skins. When that’s all that’s available, I partially peel the cucumbers so that a little bit of skin remains. This adds great color and a bit more crunch. If the regular cucumbers have tough seeds, I cut them in half lengthwise and use a spoon to scoop out the seeds. Slice the cucumbers very thinly. If you do not have a food processor or other tool, you can use the side of a box grater — there’s a handy slicer there. 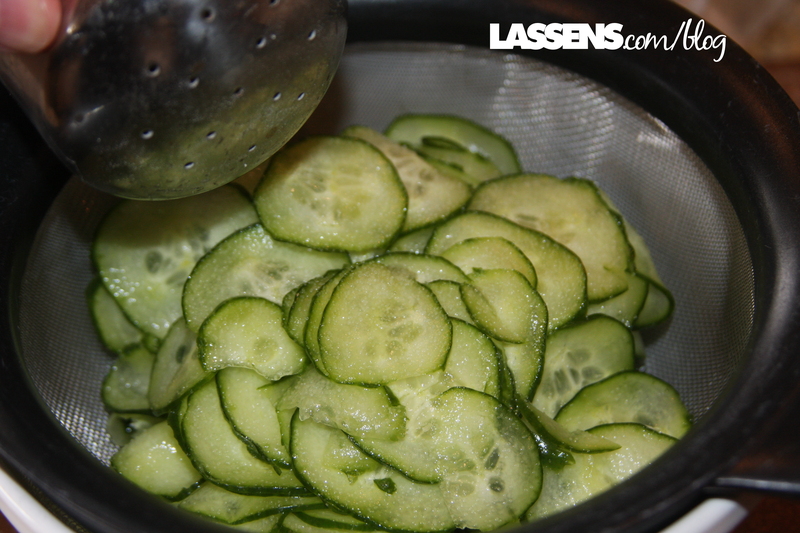 Place the slices in a strainer over a bowl, and then sprinkle generously with salt. Stir the cucumbers so that the salt is blended in. Mix the sugar and vinegar in a small bowl, and stir to dissolve. With clean hands, squeeze as much moisture as possible out of the cucumbers. 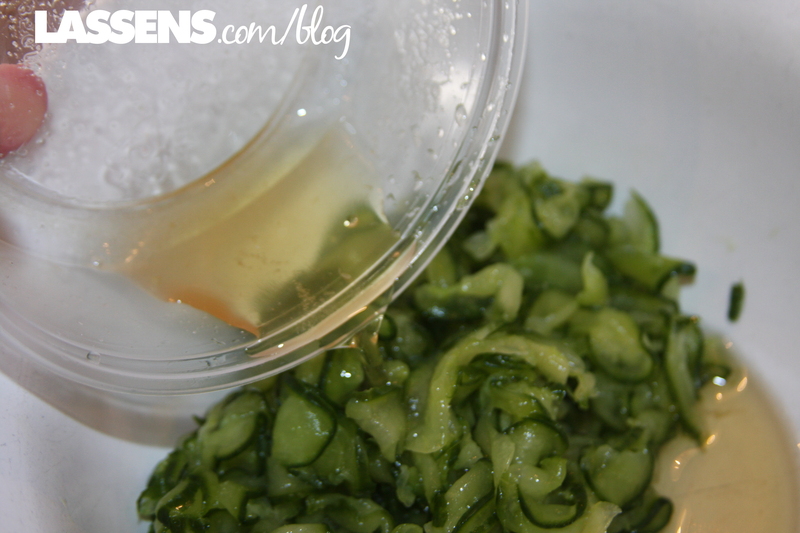 Pour the sugar and vinegar over the cucumbers, and stir to coat. Let the salad sit for another 10 minutes or so, mixing occassionally. Serve! We like to provide small dishes on the side of each plate for this salad, since there is a lot of juice. This salad will last several days in the refrigerator. Enjoy this taste of Denmark, straight from the Lassen home!